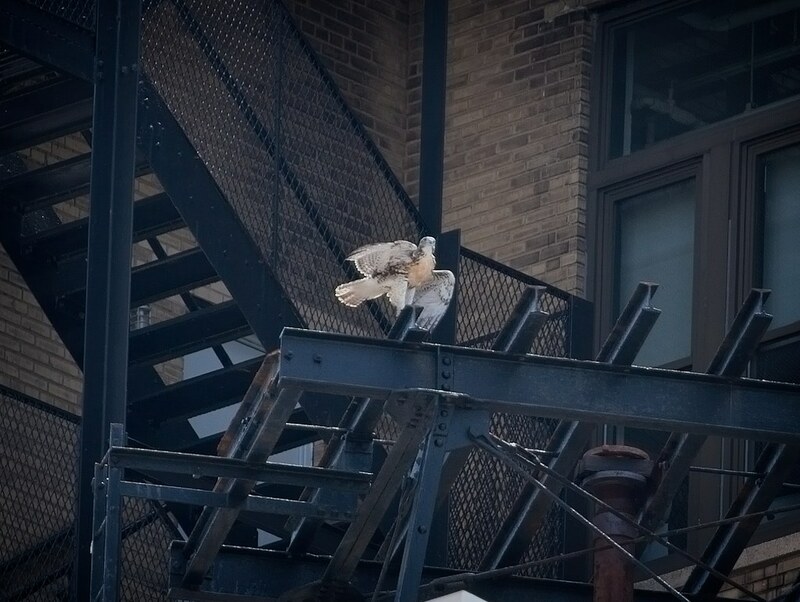 It was a big weekend for downtown hawks when the Washington Square chick fledged the nest on Saturday morning, and the Tompkins Square nestling branched out and let us get a good view of it. 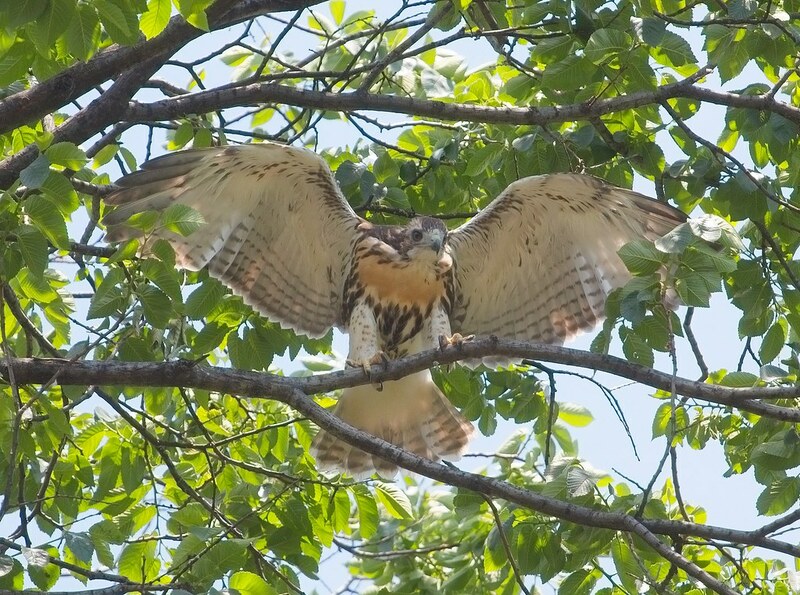 On Friday, I visited Washington Square with hopes of seeing the young hawk fledge. For several preceding days, it looked ready to go. Early in the afternoon, the nestling put on a show of wing-flapping and hopping up and down on the window ledge. After about 15 minutes of vigorous exercise, the hawklet settled down to rest, so I left the park. 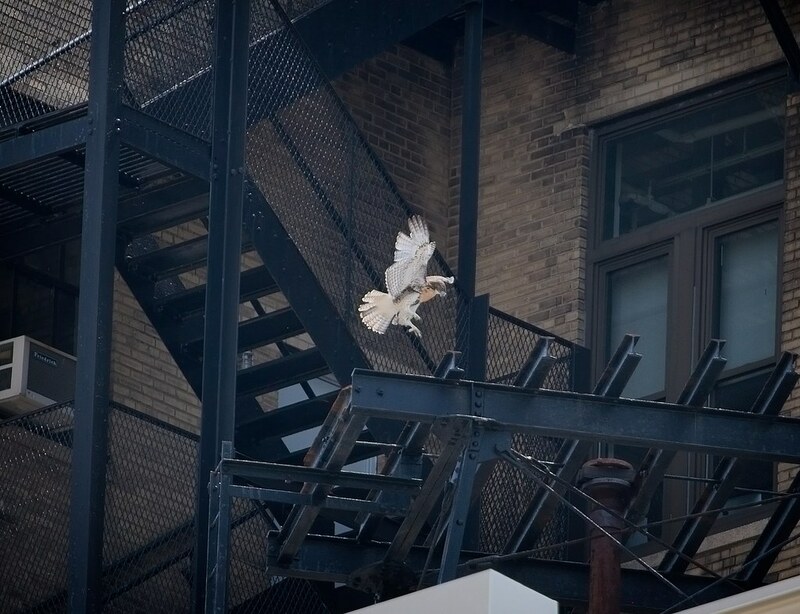 At 6am the following morning, the hawk took the big leap and left the window ledge. 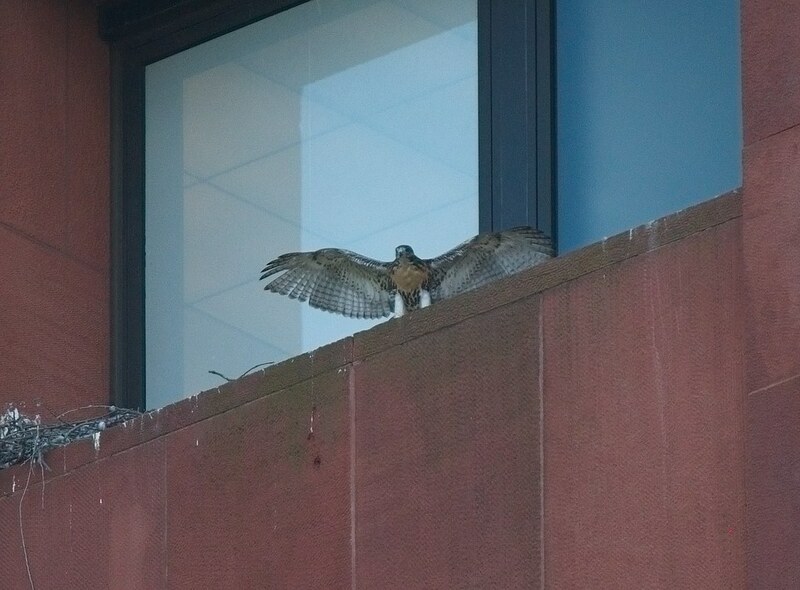 The NYU hawk cam has video of the moment here. I returned to Washington Square Saturday afternoon to see the fledgling, who was exploring a structure on a building east of the park. 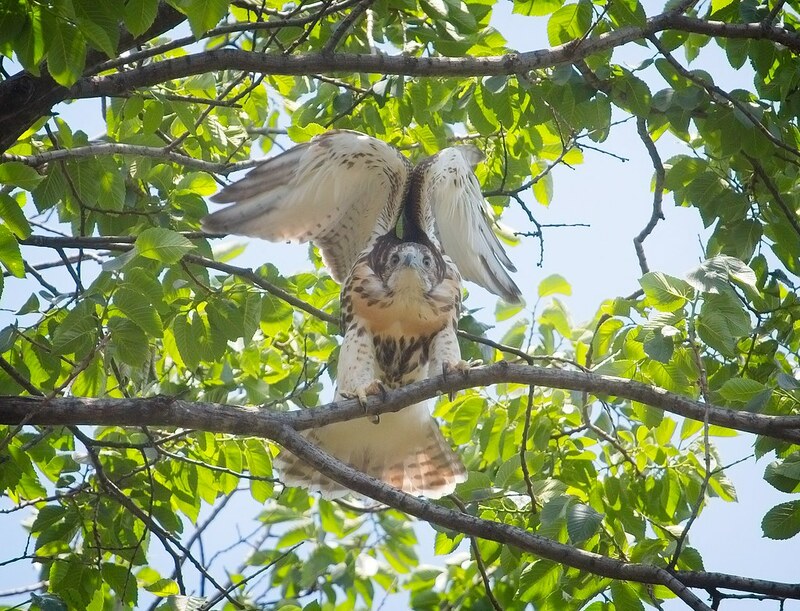 Urban Hawks has some nice photos of the fledgling, and Roger Paw has extensive coverage of the Washington Square hawk family. Back in Tompkins Square, the hawk nestling had left the nest and was exploring a branch of the tree. 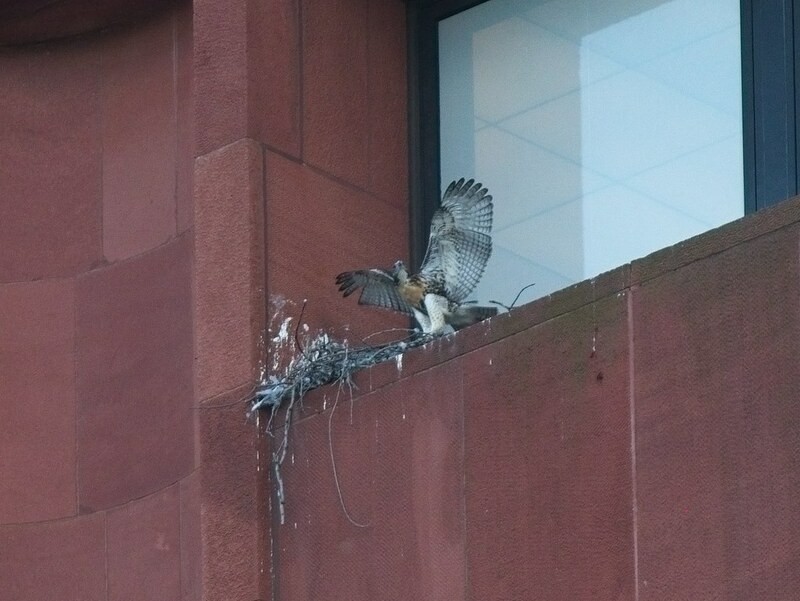 In doing so, we finally had a good look at the hawk from head to tail. The hawklet did a little stretching and flapping, but remained generally mellow. Over the last couple of days, it's been perching on the branch for long periods of time, exercising occasionally. As far as I can tell, it has all its feathers and it looks physically ready to fly, so it's now up to the hawk to make that big decision. Here is some video of the hawklet on Sunday, as it observed activities in the park and took in the sounds of the Eric Paulin Jazz Ensemble. 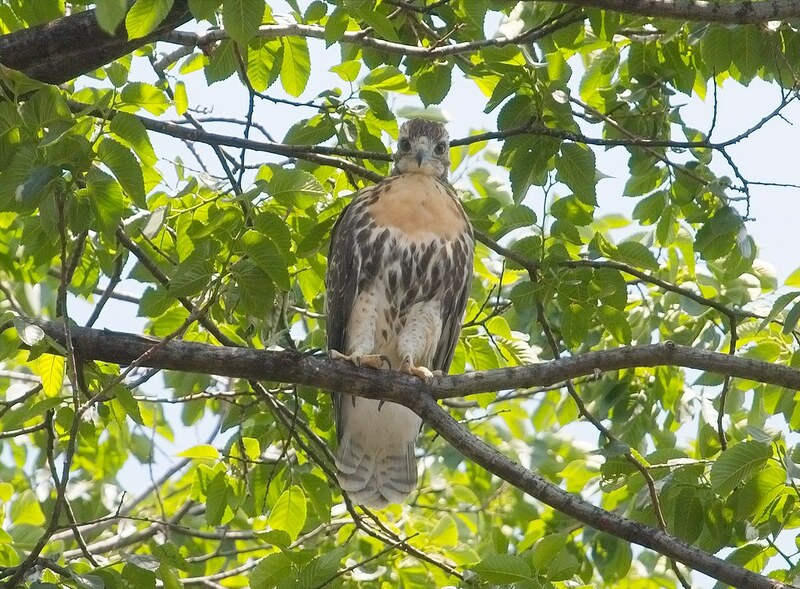 As of this posting, the Tompkins Square hawklet has not yet fledged. I'll post more photos of it branching this week.